Handwriting For Kids: Is Having Good Handwriting Still Important? One of the biggest advantages of using a word processor is the lack of spelling mistakes which surface. While a great benefit, your kid will be overly dependent on the machine rather than their own skills. As a result, their ability to spell words takes a big hit. Whether it's English or any other language, improving your kid's handwriting helps them spell better. When your child learns writes words down, they memorize how to spell and pronounce them. Whether it is SAT, HEC, O and A-Level or college examinations, almost every exam is written. The biggest problem with poor handwriting is that answers become difficult to read. When the grader cannot read or understand what's written, they merely disqualify the answer. As such, improving your kid's handwriting will ensure they know how to write clear answers which will help them ace any examination. In fact, according to Master Handwriting, your kid's poor handwriting skills may become a huge obstacle to success in life. View it for more details. While you may be filling in most of their forms now, you children will eventually need to fill in their own forms, such as bank and college applications. If they have poor handwriting, the person checking the form may not understand the information required, resulting in another form submission or incorrect data being entered. This will waste your kid's time and may pave the way for more serious problems. When you have to write using a pen, there isn't any cut, copy or paste button. As your kids write and make mistakes, they learn how to structure their paragraphs properly. They will learn how important it is to structure information so it flows easily because without this skill, they won't make sense. In fact, many research studies have concluded that practicing their handwriting helps kids develop structure in their sentences and helps them write sentences that flow better. If you want your kid to make sense on their college application or in their exams, ensure they have good handwriting. When you write on paper, you need to control your hand and fingers to ensure you write clearly and at times, cursively. The ability to control fine muscle movement is known as your fine motor skills. As such, good handwriting ensures your kid improves their fine motor skills. As a result, not only their handwriting but their ability to pick up objects, eat, coordinate and even play sports such as table tennis improves dramatically. Evidently, it's vital for kids to have good handwriting. Not only does it teach them how to write clearly, it teaches them how to spell, structure sentences, make sentences flow, fill forms, sign and give an examination. More than that, it helps them tune their fine motor skills. 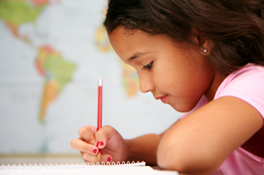 For more information about how you can help your children improve their handwriting, visit www.masterhandwriting.com.